This is one of my favorite quilts we’ve put together (even though I think I say that for every quilt we make!). 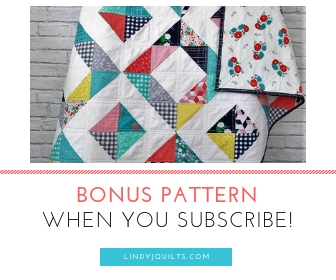 We had a bunch of low volume orange and blue prints (courtesy of our low volume club subscription at Stash Fabrics), so we thought we’d depart a little from our bright quilts and soften things up and make a quilt pattern! We loved the soft orange and blue and how they popped off of the white background. We used half rectangle triangles to create 3” by 6” units. Each unit has an orange and blue fabric. We lined the units up so that the blues are on top and the oranges are on the bottom. Mom says they remind her of little sailboats! Everything seemed be going ok, but our plan for a low-volume quilt had to change just a little when we ran out of fabric! Rather than buying more, we dug into our stash and found scraps of orange from our previous Tennessee and Auburn quilts. We even cut into some blue that we were planning to use on a future blue and white quilt – guess we’ll have to go fabric shopping soon! But we made it work – even if we had to deviate a little from our low-volume intentions. This quilt is absolutely adorable. The backing and binding are so soft (doesn’t the binding look great?). We ditched stitched the quilt in order to feature all of the wonderful prints. The pattern for this quilt is now available in our shop! If you are new to HRT’s, then this is the perfect pattern for you. This quilt is just so fresh, plush and comfortable. It will be lovely in a nursery – this quilt is listed in our shop. It feels great to have another finished quilt and we will have more on our blog and shop soon! The sewing never stops for us! Thanks for stopping by! We have 2 very cool quilt tops in the works and a finished LSU coming soon, so drop by later this week to check them out!